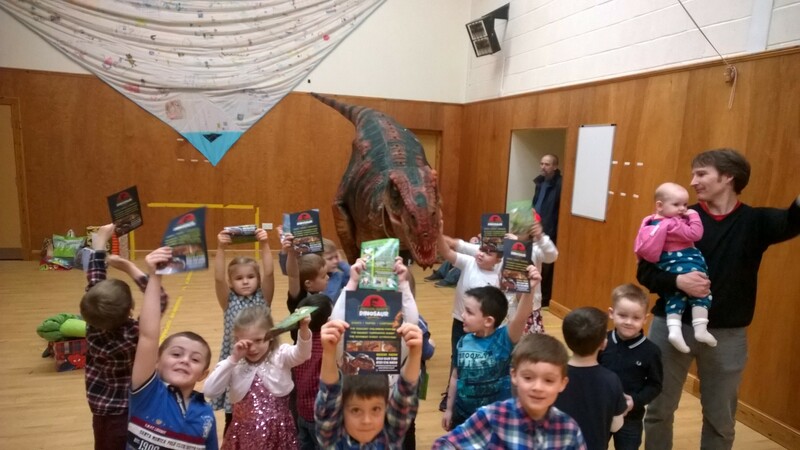 Animal Man’s Dinosaur Encounters provide the best Boys Dinosaur Party Glasgow. It’s a great show, with loads of fun. Our Giant T-Rex Barnie is the star of the show and will make your little one’s birthday party one to remember. It’s not just a costume dinosaur, it’s a T-Rex animatronic, so it’s like nothing you have seen before. Our Boys Dinosaur Party Glasgow is presented by Kevin our Dinosaur Wrangler who has 15 years experience in children’s entertainment so it’s going to go down a treat. Barnie arrives in a big horse box and makes a huge entrance. We’ll have the kids super excited and then play games and interact with Barnie. Kevin our Dino Wrangler does a 10 minute party intro, and sets the kids up for a massive surprise when Barnie walks in. We also bring a snake, bearded dragon lizard, tortoise and rat, and finish off the party with some animal handling and interaction. The Dino Party from start to finish is 40 minutes. It’s new, fresh, and super exciting. Forget clowns, magicians, crafts parties and character parties, you want to have the Coolest Dino Party for your little ones next big day. It’s easy to book and we take all the stress away from you, so you can sit back and relax, or get the food on for the little hungry party goers, who will be delightedly hungry after all the fun. It’s very easy to book, all we need is a date and venue address and we can check dates and get you booked in the diary. You can email animalmansminizoo.org.uk or call Kevin on 07957-382-580. Our Boys Dinosaur Party Glasgow is something new, and something most people haven’t seen, so if you want an original party get in touch. Hi Kevin, are the dinosaur parties only available in Glasgow? I’m in Edinburgh. Hey Carly, we cover Edinburgh too, that’s not a problem, we are in Edinburgh every week. I shall email you now with prices. Can you send me some prices for a 2nd birthday party. South side of Glasgow. Hey, I will email you now. Do you have a Girls dinosaur party?????? Yes all parties are for girls and boys. I will email you now. Hi there could you please advise me if you could do the dinosaur party in East Lothian? Also cost etc thanks! Can you please send me the details of the dinosaur party? I have already sent an enquiry for a mini zoo party but then saw this and my son is dinosaur mad. Can you please email details of both..
Hey Claire, I’ll send you an email now. Hi, Just wondering how much the dinosaur party would be for my 3 year old’s birthday party at our home on Saturday 8th July? Interested in booking for a third birthday party please but I am based just outside Edinburgh. Hey Kirsty, I’ve just sent you an email. Hi there, could I have details/price on the dinosaur party please. Can you please advise if you have availability on the 22nd July in Glasgow. Looks like a great party! Please let me know the prices and what is included. Hi just wondering how much your Dino party’s are? Hey Carrie, I will email you now. We are the Marykirk Raft Race committee , we raise funds for childrens charities . Thecommitee arrange a fun afternoon every May ,second last Sunday ) after our annual morning Raft Race . Do you travel as far as Laurencekirk area ? Also can you give an idea of prices etc . Hey Leanne, I will email you now. Can you let us know if there is a one in a million chance that you have any availability on 24th or 25th March 18? We are a bit disorganised in sorting out our son, Quinn’s 6th birthday party and have just found your amazing website. He has been able to name and identify types of dino’s since he was about 3. ( highlight of his life so far was meeting Andy from BBC Andy’s dinosaur adventures! We live in Helensburgh (just up from Glasgow and could arrange a hall etc. – please let us know costs, and how, what and everything. Kind regards, Helen. Hi could you please send me some prices for a 5 year olds party in East Kilbride. Hey Christine, sorry we were fully booked for that weekend. Maybe next year?